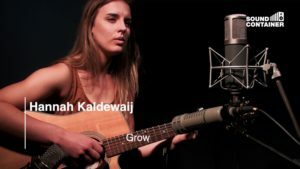 This week in the Soundcontainer: Hannah Kaldewaij! Boy oh boy, what a session it was. I wonder, if you put Corrine Bailey, Beyonce and a then some Joni Mitchell in the voice blender, would it be like Hannahs voice? Come close and listen, before she let’s you go. Subscribe and hear more tracks from her this week!